Product Details - Ingredients-Chocolate, Minerals,Vitamins, Capacity -100 Gm, Suitable - All Breeds Dogs. Product Information - A Choco bar with low sugar content to suit your poochs palate. It is loaded with vitamins and minerals and is a great training aid. Give it as a treat or reduce it into small portions while training your pooch. 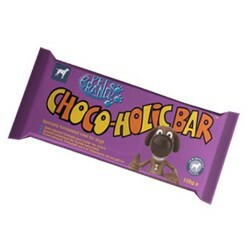 Get this delicious bar of chocolate that is specially made to suit a dogs palate. Contains reduced sugar content, it is loaded with vitamins and minerals.